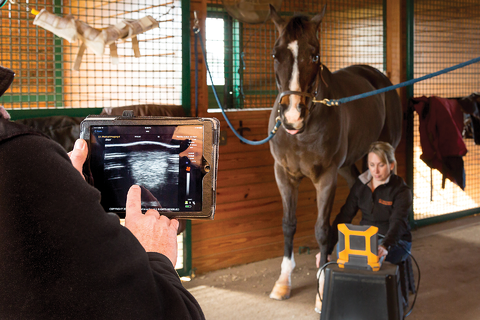 Trade-in to trade-up for equine reproduction...earn $3000 or more for any manufacturer's ultrasound! Retool to upgrade...upgrade your PRO to our new PRO/r or your LITE to our new SuperLite at a fraction of the cost. Subscribe to our blog and download Ultrasound Basics, a free ebook. Register now for upcoming Bovine Reproduction Ultrasound class. Built for the toughest environments, the Ibex® family of portable ultrasound systems takes imaging wherever you need it. Engineered and manufactured in the USA, Ibex® systems are designed with the highest levels of ruggedness in mind. Custom-designed transducers, tested to mil-spec standards. High image quality, veterinary protocols, patient image management, sealed bio-secure casing. Lightweight enough to go anywhere. Service is the hallmark of our business. We engineer systems specifically for veterinary use and understand the challenges downtime brings. With industry-leading service turnaround times and a loaner program available, we ensure continuity of your business. Built for the toughest veterinary environments, our Ibex® ultrasound platforms are the latest evolution of portable ultrasound technology. We deliver this with great image quality and processing power, all in weather-sealed, lightweight units. All platforms incorporate user-friendly patient management software. Transducer cables are tested to 1.2 million flex cycles, ensuring seasons of uninterrupted use. We are THE gold standard for veterinary ultrasound, used in top veterinary hospitals, clinics and universities. For more information or for a demonstration, contact us at 1.866.365.6596.